Crews at Kuhn Construction raised this Cape home in West Islip, NY and held it in place while the foundation was built up above the base flood elevation. If you're worried about flooding and erosion, raising your house might be the most effective way to prevent water and foundation damage. Kuhn Construction safely and effectively raises homes in Islip, Brookhaven, Smithtown and Suffolk & Nassau County using proven lifting techniques. In addition to helping prevent flooding, house lifting can also be used to add a story or increase head room in a basement. If you're looking for an experienced contractor to raise your house, contact us today to schedule a free on-site consultation and estimate. 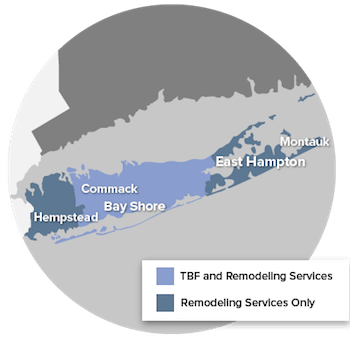 Following Hurricane Sandy, house raising has become a popular option for homeowners in Suffolk & Nassau County, especially following the release funds through FEMA and the NY Rising Housing Recovery Program for home repairs in the area. This is because lifting a home is often the most cost-effective way to not only repair structural damage to a residence, but also prevent similar damages from occurring again during future storms. For many residents, however, the need for house lifting presents a significant hurdle in the way of them getting their lives back to normal, because they must find a company they can trust to facilitate the sometimes complex process. To learn more about the comprehensive house raising services that we offer in Suffolk & Nassau County, contact Kuhn Construction today to schedule your no-obligation consultation and estimate.